Results were updated on Saturday 23rd June. If you do not wish to have your name appear in results published on this web site, write to the event administrator, Graeme Cooper. 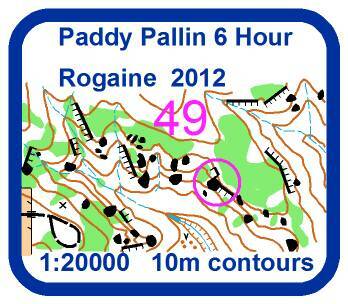 Gilbert Romaine from GiRoPhoto took a number of photographs at the event and these are now available for sale through his website at "http://www.girophoto.com/?p=665"
The 49th Paddy Pallin 6 hour winter rogaine was held on Sunday, 17th June. 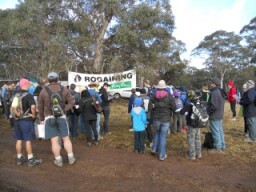 This Rogaine was a six-hour event for teams of 2 to 5 people, with a mass start at 9:10am and concluding at 3:10pm. 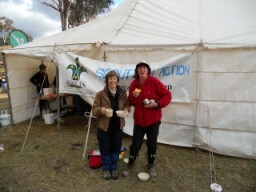 The event was located approximately 4 hours west of Sydney CBD, near Clandulla, 1 hour north of Lithgow. The course took in an area made up of predominantly rolling spurs and ridges with some areas cut by meandering creeks, honeycombed by rock outcrops, small canyons and a few waterfalls. A few springs emerge with glassy water ejected from their stony canyon floor. Marvellous views occur from high ridges that plummet to the creek or where rocky pagodas penetrate the forest canopy. Vegetation is open eucalypt forest with very little undergrowth, although some areas of cypress pine exist. Visibility will be very good and progress quicker if navigation is accurate. There are some steeper areas but most of the terrain has gentle slopes. 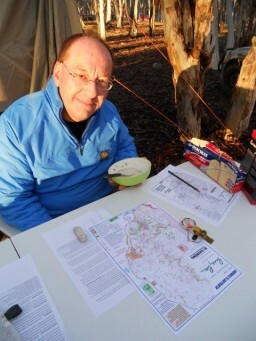 Here is a view of a small section of the map provided by the course setter. 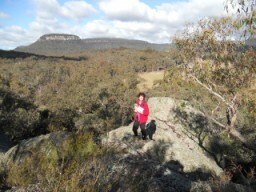 It shows one of the "pagoda rock formation" check points that were used in the event. Notice impassable cliff flines and other large rock formations are mapped. Also, notice a rocky pit in the valley representative of the small areas of gold mining found in the area and being used as check points too.